The Cape of Salou is a large rocky headland jutting into the sea that, together with the Ebro Delta to the south, delimits the Gulf of Sant Jordi. It is a very interesting place, both from a biological as well as a geological point of view. Biologically, it is interesting for the distinctive vegetation that can still be seen despite the large number of buildings: palmettos, blue immortelles, etc. For geologists there are the rock emergences from the Mesozoic and Tertiary periods and many faults and cliffs, some of them spectacular. Between the rocks there are lovely little coves with beaches of fine golden sand. Human occupation has endangered the continuity of this ecosystem and has driven out most of the indigenous fauna. However, in spite of everything, at quiet times we can still see seabirds like the black-headed gull and the common swallow. A pair of binoculars would be useful here. We hope that with the growing ecological awareness and the goodwill of the people of the area, the natural ecosystem will not only be preserved, but may even regain some of what has been lost. 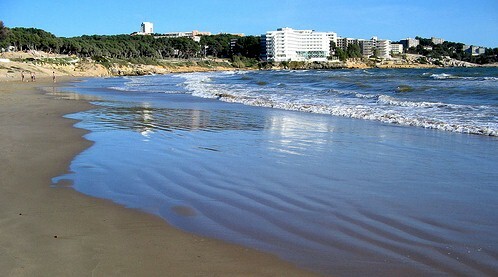 The coastline of Salou has always been one of the most beautiful attractions of this area. Paradoxically, the urban development designed to accommodate visitors who come to enjoy this beauty now threatens to destroy what brought them here in the first place. We now have to make a great effort to rescue as much as possible of what remains of its natural beauty, flora and fauna and bring it within reach of as many people as possible. That is the intention of this itinerary and the others in the series. On your route you will see lovely beaches of fine golden sand, alternating with the calcareous rocky outcrops that form the Cape of Salou. The vegetation here has to withstand very strong sun, a scarcity of fresh water (the calcareous rock is porous and retains little rainwater) and the salinity brought by winds and storms. Such harsh conditions have meant that only the hardiest and best-adapted of species have been able to survive. For this reason most of the plants have very small, hardened leaves that in some cases have developed into thorns to prevent foliar transpiration. Another adaptation is seen in the so-called coarse plants. They have thick tissue in which to accumulate water to see them through periods of drought. Let us stop a while to contemplate these little wonders of nature. They are not as spectacular as the plants in wetter areas, but they are worthy of our attention and respect. Les Parellades: You may think that cultivated plants are not of interest to the naturalist, but nothing could be further from the truth. In the first place there are plants cultivated by man. These are no more than wild plants that have been taken and genetically improved in order to obtain the maximum benefit from them. In this area there are few market gardens, due to the lack of water, and austere trees and plants, well-adapted to the climate, dominate: the olive, the carob, the vine, the almond and the hazelnut. Near the masias (typical Catalan farmhouses), you will find other trees, planted mainly for shade or for fruit: the fig, the medlar, the pine and the oak. An important group of plants takes advantage of uncultivated areas or temporarily unused fields and especially the sides of roads and abandoned fields.